Note: it’s very odd to see yourself as virtual 3D. The app works by mounting the Structure Sensor to an iPad and then roving the camera eye every which way over the subject you are taking a 3D picture of. You could theoretically take a 3D picture of yourself but you’ll have to be sure to get every angle, not blink and hold the camera steady. Best to get a friend to help you with this instead. But just think of all the fun you’ll have turning you and your friends into virtual characters for gaming…or bobble head dolls. It works by uploading captured images into A 3D cloud such as Sketchfab and then implementing the image in a game, mobile app or downloading onto a 3D printer. This kind of tech used to require an expensive 3D scanning unit that was tied to a game console or a computer. Now anyone with an iPad and the Structure Sensor can create 3D models using objects they see around them. This opens up a world of possibilities for engineers, designers, inventors, architects and manufactures. One example might be an architect creating a 3D tour of what the building will look like inside and out before it’s ever built or an interior designer creating a virtual room to display their work. Using the app to create objects for Oculus Rift is another possibly cool application here. Occipital spokesman Adam Rodnitzky pointed out that virtual objects can interact precisely with the geometry of the physical world in Oculus, including occlusions. Fans of the Battle Star Galactica prequel Caprica will most likely get a kick out of a game that uses their own precise likeness in a hologram world. As you can see in the pictures above, the augmented reality technology of Occipital can capture some pretty high quality imaging using the ItSeez3D app as well. Printing exact objects into the real world mainly depends on the quality of the 3D printer. However, objects kept in virtual reality can remain intact. The Structure Sensor that works with ItSeez3D was launched on a Kickstarter campaign this last fall. That campaign raised over $100k in the first 3 hours and continued on rake in a total of nearly $1.3M from over 3500 backers. That campaign challenged developers to create reality games and mobile apps using the Structure SDK. “We recognized the immense potential of Structure Sensor early on, and Itseez3D represents our efforts to weave advanced computer vision technology,” says Itseez3D creator Victor Erukhimov. While the app is designed for iPad, a good hacker will be able to rig it for use on any iOS device, including a smartphone. It can technically hook up with any iOS device that has a Lightning dock connector. Occipital is also considering making a sensor to fit specifically on phone cameras so users can make 3D models of any object on the go and then upload that to the cloud to, say, 3D print it at a later date. While Structure Sensor will be required to scan images, users can still download Itseez3D to view sample models. While this is the first third party app offering from Occipital, they’ve made it easy for more like it coming down the line. Developers are able to use the Structure SDK to create an app in Xcode and hit deploy. Occipital also bundles a few other in-house apps for gaming and other applications to use with the Structure Sensor. 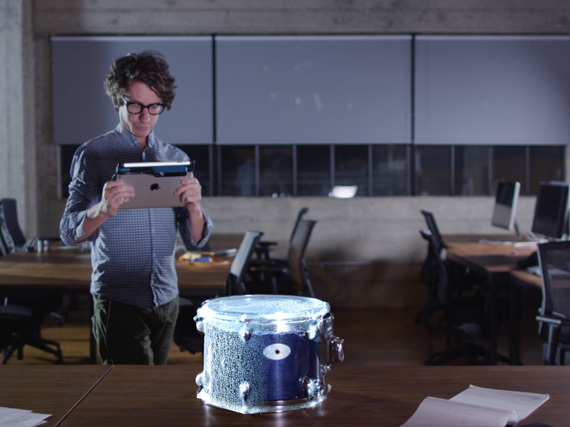 The actual Structure Sensor from Occipital runs for $379, or $499 with the app bundle. ItSeez3D is free in the App Store. Not sure Alex or I need a 3D bobble head of ourselves on our desks (trust, weirder stuff turns up all the time here), but it is kinda cool to think of playing myself in a virtual game or walking through and seeing what a building will look like in 3D before it’s built.